GREAT CONDITION POWERED STRYKER & HAUSTED AMBULANCE RESCUE STRETCHERS GURNEYS READY FOR USE OR NEW PURPOSE AS SCHOOL NURSES OFFICE BED, MOBILE ICE HOUSE BED, UNDER VEHICLE MECHANIC'S CREEPER, CLINIC TREATMENT TABLE PLUS MORE! THESE TRANSPORT TABLES ARE READY FOR ACTION AND ARE BUILT TO LAST A VERY LONG TIME! *PLEASE NOTE MOST UNUSUAL IDEA FOR THE USE OF THESE STRETCHERS WILL RECEIVE A $20.00 CREDIT VOUCHER TO BE USED ON OUR NEXT AUCTION...JUST EMAIL US YOUR IDEA Jirehtradingco@gmail.com THIS OFFER WILL END AT THE CLOSE OF THIS AUCTION! *****THERE ARE SOME VERY BIG PIECES OF EQUIPMENT IN THIS AUCTION - PLEASE BE SURE TO BRING APPROPRIATE EQUIPMENT & HELP TO LOAD THESE PIECES ONTO YOUR TRAILER. ***UPDATE - WE WILL SHIP LARGE EQUIPMENT BUT ASSUME IT WILL GO BY FREIGHT FOR AT LEAST $300 - $400 - IF YOU LIVE CLOSE BY PLEASE CONTACT US FOR SHIPPING CHARGES. PLEASE ALLOW UP TO 2 WEEKS FOR YOUR SHIPMENT TO BE SENT. Adjust the unit’s height and Trendelenburg positioning with integrated, hydraulic foot controls. The pneumatically-assisted fowler adjusts the backrest from zero to 90 degrees. Dual accessory wells at each of the four corners allow for a customizable accessory configuration. The Steris Hausted Horizon Stretcher is available with retracto rails. Thermoformed base cover is seamless and easy to clean - used & free with stretcher. Base design includes built-in oxygen tank holder and storage area for patient belongings. Dual pedestal base construction ensures patient stability. Adjustable patient surface features powder-coated finish. Pneumatically-assisted fowler adjusts backrest positioning zero to 90 degrees. Hydraulic foot controls manage height adjustment, Trendelenburg positioning. Non-marking corner bumper system protects walls. Four brake / steer levers at each corner for easy maneuvering. Dual accessory wells at each corner for multiple accessory configurations. The Steris Hausted Horizon is a multi-purpose stretcher designed for a wide range of uses in any department. The stretcher is stable and durable enough for patient transport, while the thick mattress allows for premium patient comfort. Tread Has Worn Away On Wheels...Still Works Great! A cost effective basic fixed-height Stryker 721 Transport Stretcher with Fowler (manual), Side Rails, IV Pole and O2 Tank Well. The simple design of the Stryker Transport Stretcher provides safe and efficient transport. Ideally suited for the ASC environment. The Stryker 720 also has Central Brake and Steering functions,that features a fifth wheel mobility for easier traction and cornering. Additionally, the Stryker Transport Stretcher also features a Modern Design and a 500 Lbs Weight Capacity. 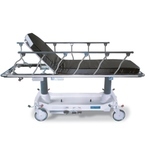 Hausted® Fluoro-Track Fluoroscopy Capable Hospital Stretchers are intended for fluoroscopy, endoscopy, pain therapy, or surgical procedures, as well as transport of patients in healthcare facilities. The Hausted Fluoro-Track offers unparalleled space for C-arm access, the security of a treatment table, and mobility of a stretcher. The hourglass shaped base with trimmed sides creates an excellent window for C-arm access, while the full length radiolucent patient surface, with easy to operate sliding top enables a broadrange of imaging capability. To ensure patient comfort, the patient surface can be adjusted through a variable range of positions, including stretcher height adjustment and backrest adjustment. Easy-rolling casters provide full mobility and maneuverability. WOW Stryker Electric Hand Rail Power Controls Stretcher Gurney Tilt Hi & Low Knees UP DOWN TOO! Many Uses Including Mechanics Working Under Vehicles Or Even As A Bed! Stryker Transport Electric Stretcher Synergy Series Gurney Hospital Medical Clinic Tilt Hi & Low Sit Up Knees UP DOWN Great Working condition! Trend/reverse Trend: +/- 18 deg. Patient Surface: 30" X 75.5"
Side rails: 13" X 55"
Please note pick up will be at 16205 Elm Road North Maple Grove. The map might say the zip is in Osseo but it's Maple Grove! - Please NO Early Arrivals!